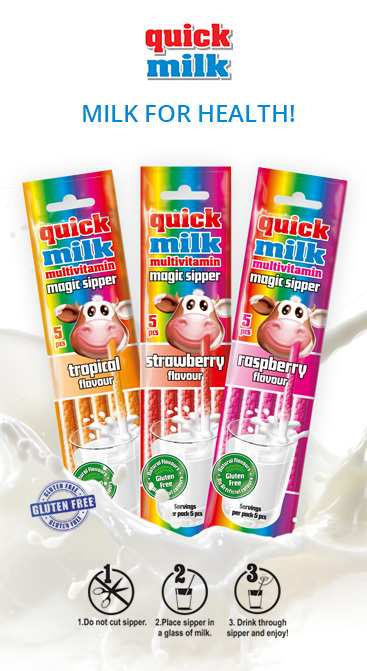 Quick Milk Multivitamin Magic Sippers are the perfect combination of Yummy and Healthy. Top 3 facts that you need to know about this product: 1. It contains essential vitamins for the body:Vitamin C, Vitamin B3, Zinc, Vitamin B5, Vitamin B6, Folic Acid, Vitamin B12, 2. We have developed the product by the advise of GP's and Pharmacist so it's absolutely safe. 3. It contains only natural flavours. Gluten-free, suitable for lactose intolerants as well since it is just as tasty with coconut milk and soy milk.